Have you ever watched the TV show Restaurant Impossible? Chef Robert Irvine revamps failing restaurants and gives the owners new hope for success. He often has to not only deal with bad management (and frequently, bad food), but attempts to fix relationships as well. Many of the restaurants succeed, but there are quite a few that still fail or get sold. When I watch the show, I get to pondering on how the agreements and plans are akin to New Year's resolutions. The root problem still remains. People get involved in "12 Steps" recovery programs that have a pretense at Christianity, but actually give a false gospel. We have bad feelings, so a shrink gives us medication to make us feel better. Various cults form so people can have a god that they can cotton to instead of the real God of the Bible. Same with the "seeker driven", Word of Faith "prosperity" heresies, hyper-charismatic excessive emphasis on tongues and use of false prophesies, liberal "Christianity", some seek salvation in religion without the Bible, and other tap dancing on the Bible movements. People even make a religion out of politics. The root problem still remains. Evolutionists get burrs under their saddles when you mention this, but evolution has a religious nature to it. Just consider this for a spell. Evolution is originally a pagan religion (see discussion and documentation in "Evolution and the New Atheo-Fascism") and a cornerstone for the religion of atheism (and Secular Humanism, which is atheism in its Sunday-go-to-meetin' clothes). But evolution can stand on its own as a religion. It has its creation mythology (usually the failed Big Bang hypothesis) and salvation (increasing order and complexity). There are evolutionists who are evangelistic, seeking to destroy biblical creationism. (Also, many atheists want to destroy the faith of Christians while also justifying their own excuses for rebelling against God. Evolution is their primary shootin' iron.) Indeed, many are on a secularist jihad and ornerier than a burlap bag full of sidewinders. 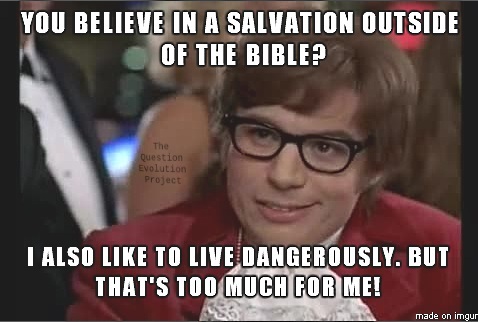 It's almost funny how some of these Darwinistas will call us "liars", "science deniers" (based on the sneaky bait-n-switch fallacy of equivocation, making "evolution" into "science"), and even "compromisers", even though they have no grasp of the Bible that they disbelieve anyway! Worse for them, creationists often have to correct them on science and their own evolutionism beliefs. The most obstreperous atheopaths prefer to attack people with emotive language and accusations rather than intelligently discuss content, and become furious when their logical, theological, and scientific failings are pointed out. In the area of origins, there are many compromisers. One of the first names many people think of is Hugh Ross, who uses bad theology and apologetics to deny the recent six-day creation, and he also advocates a local flood. His disciples try desperately to find excuses to avoid scientific evidence that refutes an old-earth view (see the short video, "Dr Mark H Armitage Responds To Dr Hugh Ross on Soft Tissue in Dinosaur Bones" for one example). Atheists are fond theistic evolutionists, and then old-earthers, since they're closer to atheism and willing to compromise on Scripture. They often work together to ridicule biblical creationists. Hugh Ross is being measured for a big millstone as we speak for denying scriptural authority and helping others do the same. The spam link mentioned in the first paragraph really takes the rag off the bush. It takes you to a fundamentalist evolutionist site where evolutionism supposed is to stamp out all gods, lead us into an enlightened age, and usher in world peace. For those who want to see this train wreck and maybe count the logical fallacies, see "Evolutions Law". Even so, the root problem remains. New Age religions offer buffet-style worldviews. It doesn't matter what you believe. A bit of Christianity, add some Hinduism, a heapin' helpin' of opinions (do not add reasoned epistemology, it wrecks the flavor) — and especially evolution. That's mandatory, old son. New Age is "do what you want" and "gay is okay", indulge in your pleasures and still be "spiritual". But the root problem remains. That root problem is sin, and these things are false salvation efforts — other "gospels", if you will (Galatians 1:8). Any of them can help you feel good about who you are; you don't have to humble yourself before the real God, repent, and believe in Jesus for salvation for your sins. With these false salvation things, make all the decisions you want, have a wagon-load of good intentions, make promises, saddle up your own religion — you're still the same sinful you (Romans 3:23, Romans 6:23). Back in Eden, the serpent threw aspersions on God's integrity by twisting God's words when asking, "Did God really say...?" (Genesis 3:1), calling God a liar (Genesis 3:4), and lying himself (Genesis 3:5). Man has wanted to be his own god from the beginning of creation, and even tries to pretend that God doesn't exist (Romans 1:20, Psalm 53:1). The religion of evolution helps foolish men build that faulty tower. When atheists and evolutionists attack God's people for believing and standing on his Word, they are not exactly attacking the Christians, but God himself. Sure, they hate us, but they hate us more because God is in us (2 Timothy 1:14, 1 Corinthians 3:16). They attack us, they attack our Creator. Some call themselves "freethinkers", but they are Satan's hand puppets, under his control (John 8:44) and their eyes are blinded (2 Corinthians 4:4). Their mocking, deceived, blind selves seek to destroy the gospel (especially the message of biblical creation, which is the foundation of the gospel). They want to destroy the truth. God doesn't take kindly to people interfering with his people's understanding of the Bible (Mark 9:42, Revelation 22:18-19, 1 Corinthians 4:6, Proverbs 30:6). Hear that, Dr. Ross, Clinton Richard Dawkins, Bill Nye, Laurence Krauss, and others? There is only one true salvation, and that is found in Jesus Christ, God the Son, the creator of the universe. To learn more about this, click on "Good news". Take a looksee at the parody of Billy Squier's "The Stroke" by ApologetiX, below. By the way, the original song was about psychological "strokes", which were often used for manipulation.